FOOD SAFETY: TRAINING TO FOOD BUSINESS OPERATORS OF FIVE DISTRICTS. TRAINING TO FOOD BUSINESS OPERATORS OF FIVE DISTRICTS. Recently, the General Secretary of Karaikudi Bakery Owners' Association talked to me over phone and requested to give a guest lecture about the Food Safety and Standards Act,2006 and its implementation in their Regional Conference to be held on 22.01.2012 at Karaikudi. When I entered the Auditorium where the Regional Conference was held, I was surprised to see the Exhibition of the various companies doing business related with bakery industries. 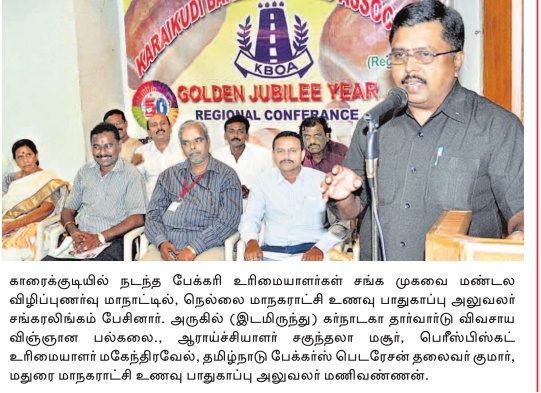 I wondered at the pains taken by Mr.R.Kaleeswaran, Honarary Secretary of the association. The exhibition would definitely help the Food Business Operators to sharpen their knowledge in the field. The conference was arranged in the first floor of the auditorium. It was worth listening Dr.Sakunthala Masoor, Scientist in Dharwad University, Karnataka, who gave a lecture about nutrition in bakery foods. She explained how the bakery foods could be manufactured with necessary nutrients. Mr.M.Manivannan, Food Safety Officer, Madurai explained about the new Act. Then I started my lecture with the brief introduction of ancient bakery industries and how the baking was invented by the ancient people. Then I explained the traders about the salient features of the Food Safety and Standards Act,2006 and its aim to improve the standard of our Indian food at par with International food. Removal of spoiled products from factors. Really, it was an exciting experience to give a guest lecture in the Regional Conference organised by the Karaikudi Bakery Owners' Association. 'Everonn' from Chennai distributed a questionaire to get the feedback of the Food Business Operators on the Guest lecture and gave the FBOs a training certificate. Labels: BAKERY OWNERS' ASSOCIATION, FOOD BUSINESS OPERATORS, FOOD SAFETY TRAINING, KARAIKUDI, TRAINER, TRAINING. Now a day very important subject is Business Training. When a business run successfully then Manager large knowledge about his Business Training. So it is a helpful blog to new business.